Coming back through the airport last week I was reminded just what a major hub London is for people wanting to access different parts of the world, something that isn’t necessarily a good thing when it works in favour of international criminals. 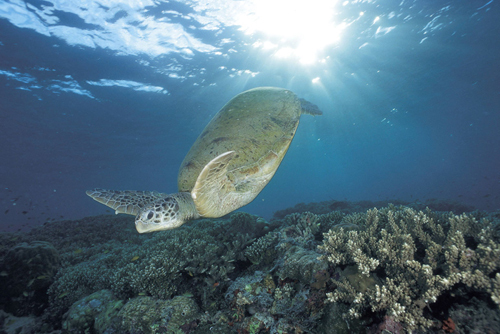 Turtles are hunted for their meat, eggs, skin, shell, and body fat. A new exhibition run in conjunction with the Metropolitan Police and a number of wildlife organisations is currently being staged at London Zoo where some of the thousands of confiscated goods from the illegal wildlife trade in Britain are on display. The illegal wildlife trade is estimated to rake in between £6-12bn a year according to the Met and the capital is considered to be a hotspot for Europe’s illegal trade in endangered species. That sum now rivals the illegal drugs trade which is worth £8bn a year says the Home Office. Wildlife crime continues to be a lucrative business thriving not only in London but elsewhere in the UK. The exhibition includes a stuffed 10-day old tiger cub. Shahtoosh shawls made from endangered Tibetan antelope or chiru which were confiscated from a Mayfair boutique. A Crocodile skin handbag seized from a London taxidermy trader and ivory shaving brushes that had been on sale at a St James’s barber. Organisers hope to educate the public about this problem so they don’t knowingly or unwittingly buy these types of goods. The police is also asking people to contact them if they see such items being sold. The illegal trade is not only driving species towards extinction but it also has direct impacts on ecosystems and the livelihoods of local people in some of the world’s poorest countries. Since the police launched its investigation in 1995, Operation Charm has seized more than 30,000 items. 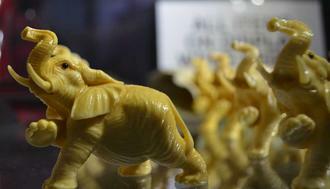 Despite a global ivory trade ban, elephants continue to be poached for their tusks and many items have wound up here and can be seen being sold over the internet and at antique fairs. 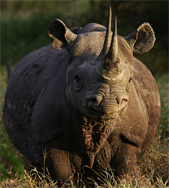 The world’s largest rhino horn was seized in 1996 valued at several million pounds. The horns are used in traditional Chinese medicine – it has no medicinal value whatsoever, people may as well chew their fingernails. Prosecutions do happen, but the sentences are not severe enough, in my opinion, so there’s no real deterrent. In 2000, a north London man was jailed for 6 months for selling taxidermy specimens of endangered species. Police searched his shop in Islington and they seized more that 80 items including gorillas; chimpanzees; tigers; leopards, sea turtles and endangered birds. The exhibition is being staged at London Zoo’s Old Elephant House and runs for a month. notes: Operation Charm is a partnership between the Met Police’s Wildlife Crime Unit; the David Shepherd Wildlife Foundation; the International Fund for Animal Welfare (IFAW); WildAid; the World Society for the Protection of Animals (WSPA) and WWF-UK.